I had the pleasure of not only feasting on the above delicacy from Old West Ranch in Alberta, but I also had an amazing conversation with farmer and cheesemaker James Meservy. At the end of it I was convinced he should host his own radio show, the man is a natural story teller. But part of it is that he has an amazing story to tell. 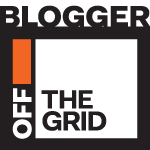 You can read the piece in my article in today’s Globe and Mail, but I never have the space I wish I had to full tell a cheesemaker’s story…….so here’s a little bit about James, his wife Debbie and their journey to cheesemakerdom (they started off as beef farmers) which didn’t make it into the piece. 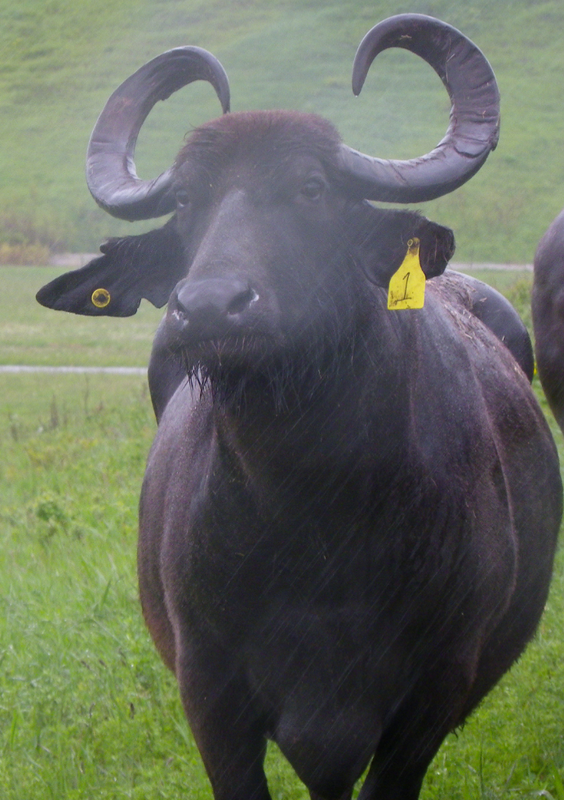 Patch the Water Buffalo, in the rain. Photo by James Meservy. With no formal training other than a home cheese book and a half-day spent at a Vermont mozzarella plant he made his first batch of cheese in March 2010. Popping 10 balls of mozzarella into a jar he started canvassing Calgary restaurants. The response was overwhelmingly positive, his mozzarella is now on the menu at the renowned River Café (among others) and sold at Janice Beaton Fine Cheese. James’ (and his family’s) perseverence seems like it could move mountains. Perhaps typical of many agricultural families. His cheese is pretty amazing. James says he’s not trying to replicate the Italian version, he’s doing his own thing. His goal was to create a more robust expression of the flavours normally found in buffalo mozarella and I think he really succeeded. Take the lid off one of the containers of his cheese and just the wonderful, fresh, milky aroma will convert you. Forget babies, storks should deliver Burrata. Out of the way triple-cream cheese, Burrata is here. Here for a good time, not a long time (in the wise lyrics of the Trooper song. They used to have burrata thrown on stage during concerts.). 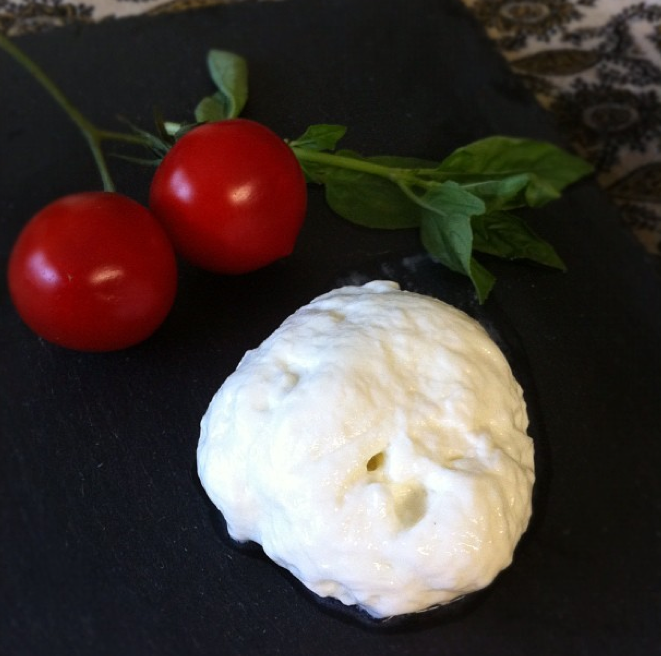 As much as you want your Mozzarella di Bufala to be fresh, you want your Burrata to be newborn. You want the exterior to be delicate and tender as possible while the inside is creamy, oozy heaven. 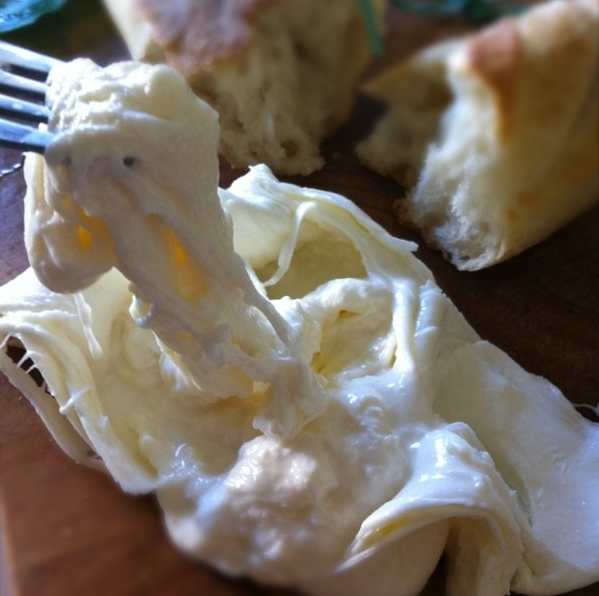 Heaven in this case being small, elastic bits of the torn mozzarella (stracciatella) mixed with rich cream. It should be buttery, sweet and fresh in flavour. It should make you weep. Just a little bit. Makes you feel a little savage. I WANT THIS NOW! 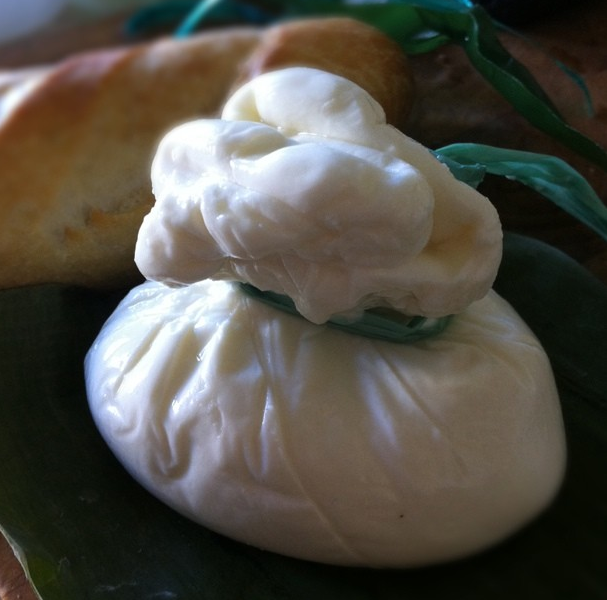 Burrata was once upon a time made with buffalo milk but now it’s made mainly cow’s milk. 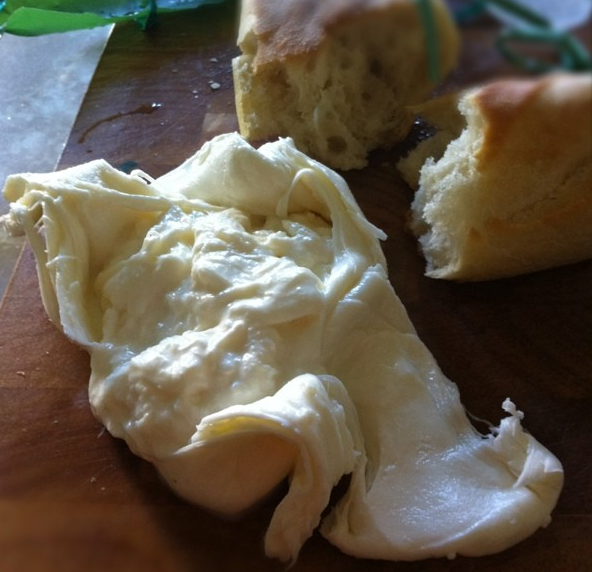 Originating in Southern Italy (in Puglia) the name comes from the Italian word “burro” (butter). You might find it wrapped in green leek-like leaves called “asphodel” and the fresher/greener the leaves, the fresher the burrata. More importantly, I have not yet made you drool to the maximum. Here is the burrata “fork to mouth”. My mouth. And I never even made it to the bread. Crazy Good. More than Pop Tarts even. No matter what you do, if you rip this open in the car while driving or serve it at home– please–eat it at room temperature. Warm it in a bowl of warm water (in a plastic bag or whatever wrap it came in) if you can’t wait to get to it. Like batteries, you can hold it under your armpit to warm it up but this is best done out of site of guests or even the general public. Burrata is now available at All the Best Fine Foods every Friday (flown in from Italy) until mid-September and on offer at Obika Mozzarella Bar.